The Tardis receives nine distress-calls from the planet of Ranskoor Av Kolos and as everyone else seems to be avoiding the area, The Doctor feels compelled to investigate. However deep beneath the surface are not only a handful of survivors from a series of terrible battles, but a threat that has a very personal beef with the Doctor and her friends. On its surface there is a shrine in the middle of a desolate landscape and it’s to this building everyone must come. 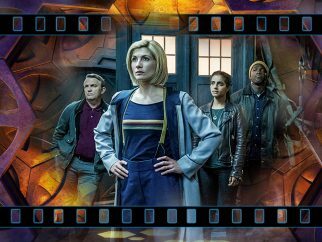 Now the Doctor, Graham, Yaz and Ryan will be faced with a very difficult choice on averting disaster and on who they and cannot can save. It seems but a wibbly-wobbly moment since everyone had their eyes staring towards Sheffield and Sunday nights for a new era for Doctor Who. 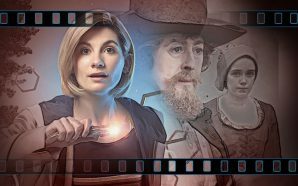 There were those incredibly excited and invested in the first female Doctor and a new creative team, who extolled its virtues before watching and others who were less enthusiastic and nay-saying, equally before a single frame had been broadcast. 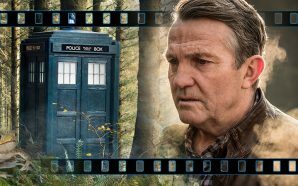 Perhaps the fairest thing to say is that now, a few months later – and unbelievably at the end of another run – the result was somewhere in the middle: an opening salvo from Chris Chibnall, Jodie Whittaker and co that had the ratings and the coverage and may well ahve won back the family demographic but with a little less of the sheer steel that we might have expected from the city and the series. In a run that for better and worse simultaneously felt like an 80/90s remix in tone (a ‘Now That’s What I Call Doctor Who‘), yet also managed to stay away from the ‘greatest hits’ supporting players/threats of old, The Doctor spent most of her time on the back-foot as Whittaker found her feet. Equally, a set of rather safely-templated stories, many with a sense of fun but few real surprises. were often shrouded in the kind of secrecy reserved for Avengers trailers and M. Night Shyamalan outings – without the payoffs. Prior to broadcast, little was known about the last episode of the run (though, arguably, the time-shifted seasonal outing, now going out on New Year’s Day feels more like the real punctuation) with even the designated favourite sites not getting their advance copies. Though some of the season-long restrictions seem somewhat disingenuous and counter-productive, one can’t wholly blame Chibnall for erring on the side of caution. In previous years, through errant leaks or simply bad promotional decisions, some elements that would have produced gasps on the night (Hello, John Simm!) had the time-winds taken out of their sales by advanced cast listings and unredacted previews. The result is that more people than ever went in to this week’s tenth story, The Battle of Ranskoor Av Kolos, cold – though there was the double-edge sword of raised expectation, that something significant and important was being hidden. Was the pay-off worth it? Mostly, yes. There was no stunning Moffaty tricksterness, but a decent adventure story with a distinct sense of book-ending (with the return of ‘Tim Shaw’ who had escaped at the end of ‘The Woman who fell to Earth‘ and had fortuitously found himself on a desolate piece of space-rock with a couple of all-powerful reality-builders who he tricked into believing he was their long-awaited Creator. As you do.) 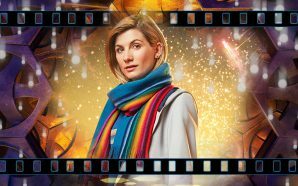 The Doctor, for the first time this season, has a very practical large-scale malevolent alien threat with a despicable plan that she has to defeat… and the audience feel the weight of it. She has to save the universe, acknowledge that her own actions played a part and still try to keep some moral high-ground as she warns Graham that any deadly revenge he’s contemplating won’t be tolerated if he’s to continue travelling with her. It’s a delicate balance and Whittaker largely pulls it off, finally coming into her own, if still somewhat saddled with a script that requires her to give a running commentary of her mental decision-processes like some sort of cosmic exposition machine. If there’s any doubt Bradley Walsh is the heart of the revamp, then that should be put aside. It’s entirely possible throughout that Graham will feel the inalienable right to take revenge for his very personal loss and Walsh sells Graham’s position as more than gung-ho violence and as a totally justified, though-out decision. That he ultimately spares Tim Shaw’s life speaks to Graham’s willingness to move forward rather than being talked out of it by The Doctor. Mandip Gill doesn’t have a ton to do but makes the most of her scenes and though he’s still largely played as a foil for Graham, Tosin Cole as Ryan, also sells his emotional stance and familial link to Graham. Mark Addy, Phyliss Logan and Percelle Ascot fulfil the roles they’re given, but Addy -in particular – feels under-used in a role that could easily have had a non-name walk through the same lines. It’s clear that any more saved from previous weeks’ fx-budgets were used here with strong post-production efforts and good use of lighting. Indeed, it’s notable that the worst set of the hour remains the Tardis interior, which compared to the console-rooms of the past and the the labyrinth of tunnels, pipes and statis-pods scattered elsewhere within the episode, still looks like a temporary Top of the Pops stage positioned in the corner of a studio. Surprise-wise, the secrecy angle doesn’t really pay-off. The Stenza returning was effective, but something many people guessed and there was no sudden sleight-of-hand. The finale was a solidly good episode rather than a solidly good finale… ticking boxes that should arguably have had their time much earlier in the run. The bigger news? One can argue that the fact that the show officially won’t be returning – sans the New Year Day ‘ Resolution ‘ – until 2020 was the worst kept secret in the industry, deftly poo-poo’d by the Powers-That-Be though not outright denied before. While some have said the delay is necessary to maintain the production quality, because of a later start to filming (due early in 2019), there’s a counter-argument that plenty of other shows manage it. Missing out an entire year of a international flagship title when you’ve just relaunched your show and are insisting it has boffo numbers, is, at best… ‘unfortunate’. Whether it’s true or not, the placing of the special on New Year’s Day now looks wholly political and semantic, simply to technically avoid a barren year for Doctor Who , even if it’s really exactly that. 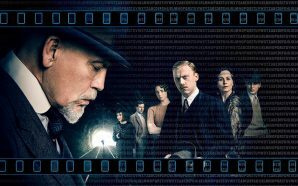 One hopes that the delay may be to accommodate the schedules of the cast – Walsh in particular is pretty busy. There’s still no news over whether the return will stick to reduced numbers of episodes or not or when in 2020 the broadcast will be. Will 2019’s Godzilla sequel prove ‘King of Monsters’..?